Denver opened up the 2018 season with a win over Saint Mary’s in the first match of the Utah Volleyball Classic. Denver dominated most of the statistical categories excerpt aces (9-9). They outhit Saint Mary’s .285 to .055 and finished with 20 more kills (54-34). Katarina Marinkovic led the match with 14 kills for Denver. She also led from the service line with 4 aces and contributed 4 lock assists to land at 20 points. Lydia Bartalo was right behind with 13 kills and 3 service aces. Becca Latham and Tina Boe both put away 9 kills each fro Denver. Olivia Novotny led the match with 17 digs at libero and scored a point from an ace. Boe (.529), Markinovic (.310), and Bartalo (.308) all hit about .300. Saint Mary’s did not have any players finish with hitting percentages above .300. Jennifer Laird led the team with a .273 attack average while notching 5 kills. Lindsey Knudsen was the only player from Saint Mary’s to score at least 10 points. She scored on 12 kills, 3 aces and a block assist. Sienna Young finished with 8 kills and hit .095, and Lindsey Calvin scored from 4 kills and 4 block assists with a -.179 hitting percentage. 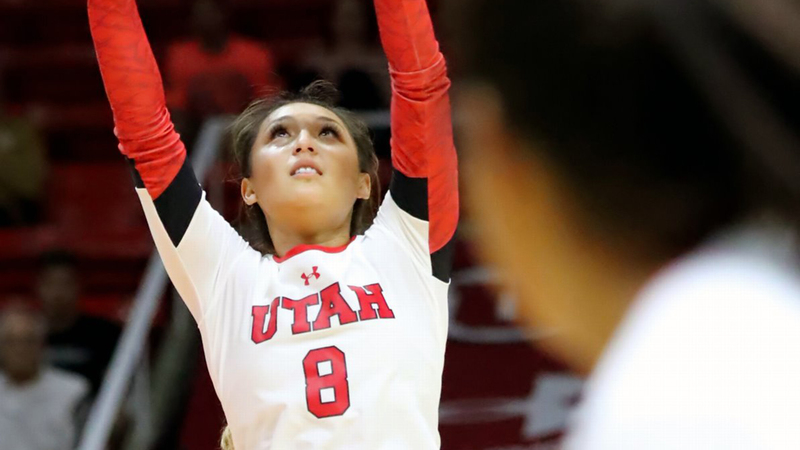 Utah, ranked #19 by the AVCA, made quick work of UC Irvine with a sweep in front of 2,463 fans at the Huntsmen Center on Friday. Utah dominated from the service line (7 aces to 2) and held the advantage at the net on defense (6 blocks to 3). UC Irvine hit -.053 in the first set and bounced back to hit .321 in the third, but finished with a .136 hitting percentage. Utah hit .235 for the match in the victory. Bailey Choy ran the offense for Utah with 27 assists. She added 2 kills, an ace and a block assist. Laura Gauta led the match with 11 kills and hit .329. Kinzie Koerber hit .417 on her way to getting 6 kills. She also added an ace and 4 block assists. Dani Drews also contributed 6 kills with 2 aces and 2 block assists. UC Irvine did not have any players score in the double digits. Laryn Carter led the way with 8 kills and 2 block assists but only hit .120. Makayla Wolfe and Harlee Kekauoha both hit 7 kills, and Wolfe posted an impressive .385 hitting percentage. Idara Akpakpa chipped in 6 kills but also committed 6 attack errors to hit .000 on the match. Their libero, Haley DeSalles, led the match with 11 digs.